I’ve always thought that if you really were a mindreader or mentalist you should be able to perform without magician’s props or gimmicks. That is precisely what Paul Voodini does. Paul describes himself as a mentalist. For the past 10 years, however, he has worked almost exclusively within the ‘paranormal’ industry. He has worked closely with some of the UK’s best known celebrity mediums and has been taught ‘from the horse’s mouth’ the techniques and tricks of the trade employed by this most secretive industry. Running a genuine seance and making it work by harnessing the power of the guests’ imagination. Setting the scene for an evening of paranormal entertainment and getting the guests in the right frame of mind. The history of seance work and spiritualism. The subtle use of hypnotic techniques in the seance room. Cold reading — what it is and how to use it. The techniques of fraudulent mediums and how mentalists and magicians can use these techniques in an entertainment setting. Combining cold reading with traditional magic and mentalism to produce routines with real power. Paul’s lectures are interactive, full of humour and amusing anecdotes, and very, very informative. Anyone attending is sure to leave with new ideas and perspectives which they will be able to apply to their own routines and performances. 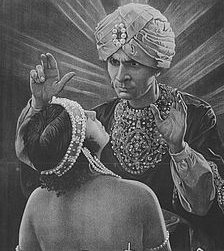 He has also written two highly-recommended books: Reader of Minds on the subject of cold reading, the techniques of fraudulent mediums, and ungimmicked mind-reading; and The Paranormal Entertainer on the ungimmicked seance and paranormal entertainment. Signed copies of the books will be available on the night. When, where and how much? I hear you cry. This very special event will take place at 7.30 p.m. on Thursday 29 April at the Magick Lounge, 82 Broad Street, Sheffield, S2 5TG. Cost is a mere £10. Be there or be forever haunted by the consequences. As someone who once worked as so called genuine Psychic in Civic Halls and theatres around the North West of England I can whole hearedly reccomend this evening! And its a bargain price too!